So, I wondered what would stand in the same proportion to my 6 ft height as my 6 ft body stands in relation to the diameter of the earth. The answer is something like 0.2621888 microns across. The average human skin cell is about 0.22 microns across, so my 6 ft body stands in the same proportion to the earth as an average human skin cell stands in relation to the height of my body. So from the earth’s perspective I, my 6 ft body, would be as invisible as an average skin cell is to me. Next, I thought about the relation between the diameter of the earth and the diameter of the sun. It turns out that there are 109 earth diameters in the diameter of the sun; or, there are 760,288,777.6 six ft bodies in the diameter of the sun. So that would mean that something that stands in relation to my 6 ft body in the same relation as my 6 ft body stands to the diameter of the sun would be 0.26 microns divided by 109, which comes out to be 0.002385 microns or 1/109th the diameter of a skin cell. I couldn’t find any natural object that equated to that, so I moved on. The average diameter of the solar system is 5,598.6 million miles, which means that there would be 6,477.40 suns in the solar system diameter or 4,924,694,528,026.2 six ft bodies. So I wondered what stood in the same relation to my body that my body stood in relation to the average diameter of the solar system. A carbon atom is about 0.0000002 mm in diameter, which means that there are 9,144,000,000 in my 6 ft height. That means that there would be 538.57 more 6 ft bodies in the average diameter of the solar system than there are carbon atoms in my 6 ft height. 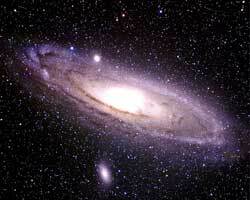 Below is a photo of the Andromeda galaxy, which is the closest in makeup to our own Milky Way galaxy. 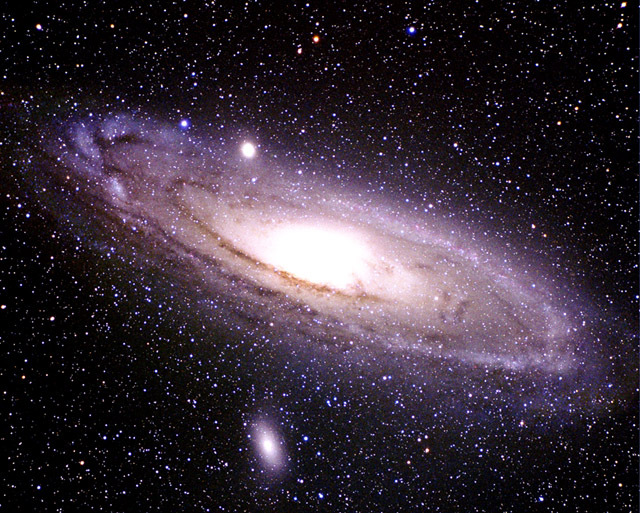 There are approximately 100 billion stars in the Andromeda galaxy, and about the same number in the Milky Way galaxy. That’s about 11 times as many stars in the galaxy as there are carbon atoms in my 6 ft height. Our sun is a third class star that would barely be seen from inside our own galaxy, and only at close proximity. From the perspective of the Andromeda galaxy our sun wouldn’t be seen at all. It would appear to be part of a gaseous haze. 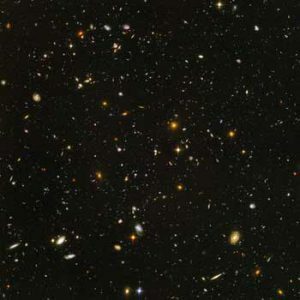 Below is a photo of just a local section of the universe. 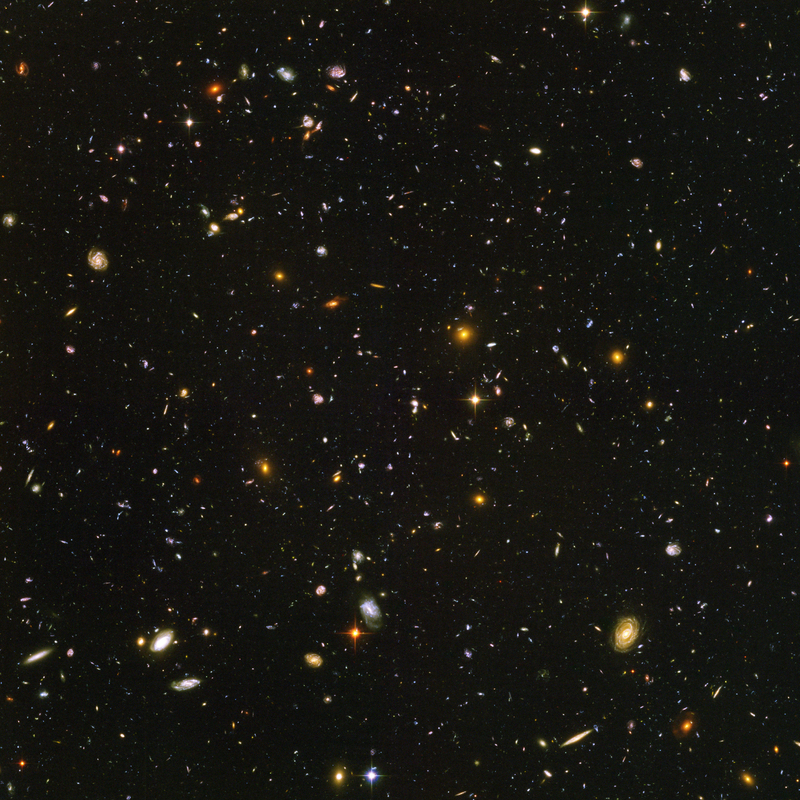 In the photo there are approximately 10,000 galaxies, all with about the same number of stars as our Milky Way. The Milky Way, the Andromeda, and as well the average galaxies in this photo all have diameters of about 100,000 light-years or 587,849,956,300,000,000 miles. There are 880 6 ft bodies in a mile, so there would be 517,307,961,544,000,000,000 6 ft bodies in the diameter of an average galaxy in this photo.